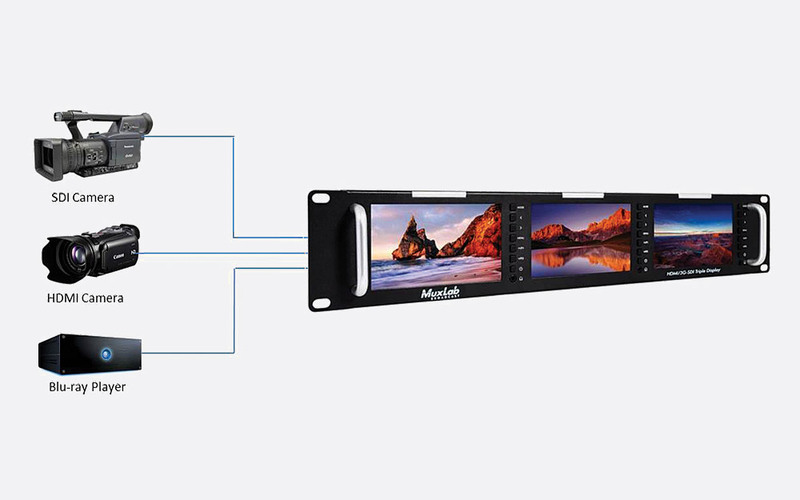 Rackmount displays or multi-displays are commonly used in both commercial and industrial industries, such as broadcast studios, film and AV studios, IT departments and data centres to give the engineer a visual indication of the output of one or multiple feeds. 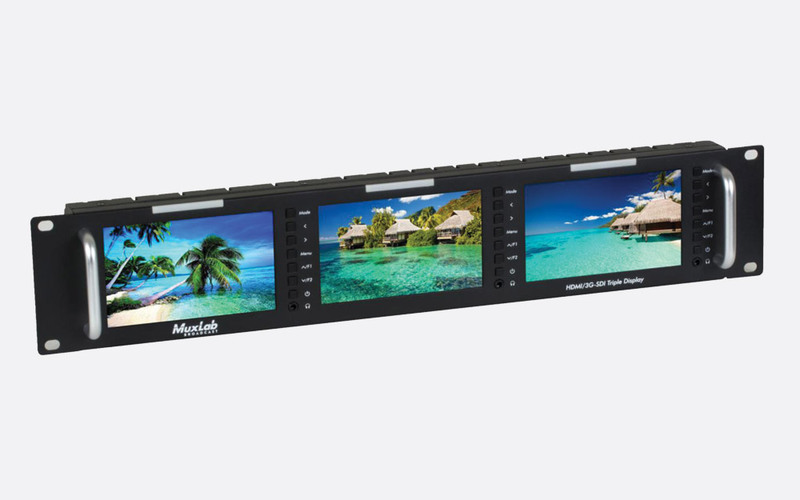 This has three 5-inch displays in a 2U rack mounting chassis and support up to three HDMI input signals up to 1080p, 60Hz, SDI signals up to 3G-SDI, and CVBS (composite video baseband signal) with audio. Each TFT LCD display is LED backlit with individual screen resolutions of 800x480 (RGB). Each display has a brightness of 500cd/square metre, with a contrast of 500:1 and a viewing angle of 70-degrees x 70-degrees left to right and 50-degrees x 70-degrees up and down. A multicolour (green/red/yellow) tally light per display is also provided. This multi-display is also compatible with 500830 Signal Generator and 500831 Signal Analyser. The front panel houses the three displays and the customisable and function buttons for each screen. These buttons include 'Mode' for signal input selection, '˂' dual function button typically used for volume down, '>' dual function button typically used for volume up, 'menu', 'F1' dual function button, 'F2' dual function button, and on/standby button. The customisable buttons can be assigned to operations such as 'centre marker, safe frames, check field, focus assist, aspect ratio, image flip, P2P, and image freeze'. Each display also has an associated 3.5mm female jack socket providing a headphone output for monitoring. The rear panel has all other I/O connections, with a 12V DC power supply input positioned above an alternative 4-pin XLR 12V DC power input. A 15-pin D-Sub connector can be used to assign tally lights dependant on input signal. 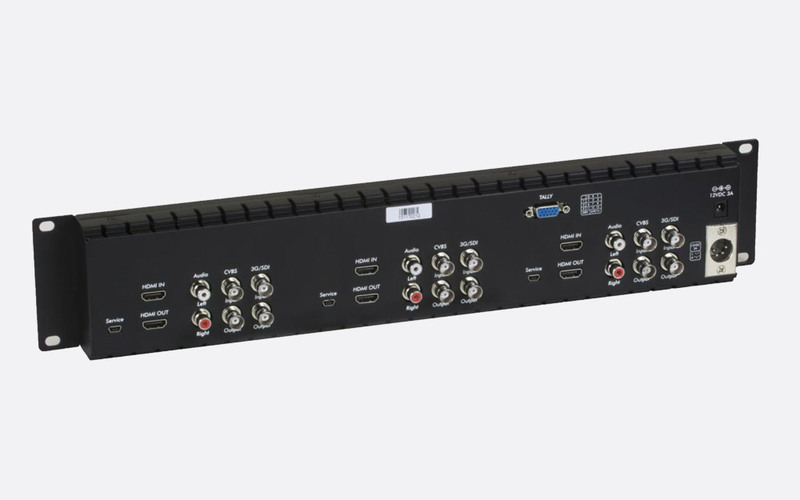 All other inputs are duplicated across each of the three displays including, 3G-SDI I/O on BNC, CVBS I/O on BNC, L/R RCA (phono) inputs for audio, HDMI in, HMDI out and mini-USB connector for firmware updates. Dimensions: 482.6 x 88 x 34 (WxDxH) mm. Weight: 1.57kg.